Visitors will learn the history of the garden center and tour its stores, greenhouses, Pumpkintown USA, and get a wagon ride tour of the center’s property. This years Guided Tour is sponsored by the East Hampton Parks and Recreation Department. 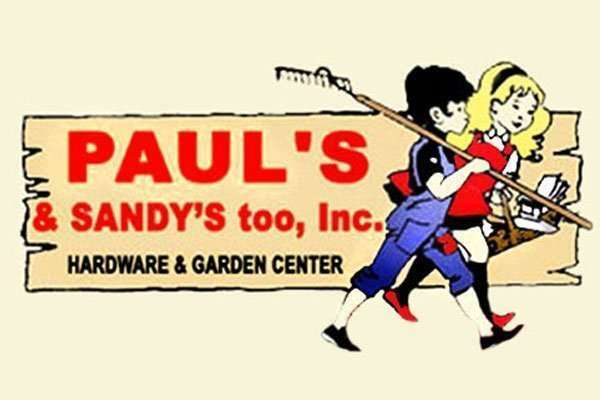 This year marks 45 years in business for Paul’s & Sandy’s Too Garden Center & Hardware Store located at 93 East High Street in East Hampton, CT. In 1954 Paul Peszynski first started selling vegetables at a stand that he and his father converted from an old chicken coop on Rt. 66. At that time his main customers were people from New York City who came and rented cottages or stayed at one of the seven hotels that were on Lake Pocotopaug. Years later Paul got married to Sandy Flemke and they had four children: Mark, Jill, Daniel, and Karen. 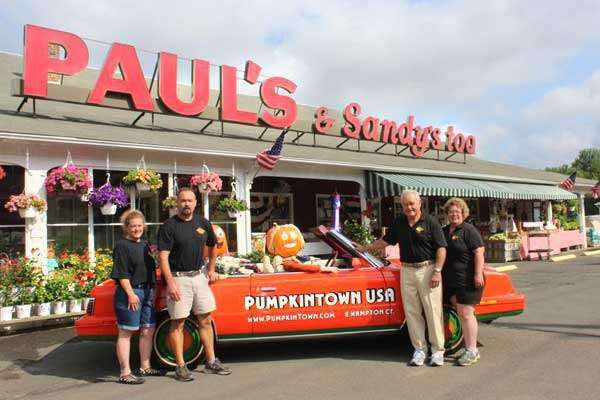 Paul & Sandy opened a toy and sporting goods store with a sprinkling of home and garden supplies and named it Paul’s Home Supply, the same property where Paul sold fresh fruits and vegetables during his summers to pay for his college tuition as a young man. As the years passed, Paul and Sandy found that the demand for toys and sporting goods declined, but the need for home and gardening supplies soared, and the transition to green goods and hardware was natural. In 1972, Paul & Sandy Peszynski opened a toy and sporting goods store with a sprinkling of home and garden supplies and named it Paul’s Home Supply, the same property that Paul sold fresh fruits & vegetables during his summers to pay for his college tuition as a young man. The sprawling garden center and hardware store maintains 15 greenhouses filled with plants, but it does not grow any of its own fruits and vegetables. Instead, a broad array of produce is trucked in daily, largely from area farms. The Business started out selling fresh produce 57 years ago, but switched over to mostly sporting goods when they opened their store in 1970. The nursery and hardware ends of the business eventually eclipsed other merchandise, and with fresh fruit and vegetables for sale from summer through autumn, Paul’s and Sandy’s has come full circle. In 1991, during one of their road trips to Vermont, Paul & Sandy came across these pumpkin-headed scarecrows along the side of the road. It stopped them in their tracks. They took pictures and their wheels started turning! What a fantastic way to drive some business in the fall, a time generally slow in the garden center business. 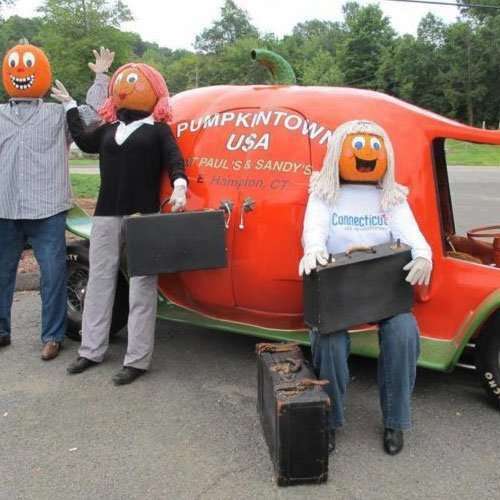 In 1992, the creation of what is now known as Pumpkintown USA was started. First came a few pumpkin-headed people, then the town we all know and love. Most recently added, The ‘Ride’ at Pumpkintown, features a mile long hay ride through the woods with over 30 additional Pumpkin Heads and their dwellings. This local attraction hosts over 20,000 people during the short 7 weeks it is open from the middle of September through Halloween. In 1993, when Sandy’s breast cancer returned, they decided it was time to fully pass the torch to the children so they could enjoy retirement together. Jill, Dan and Karen took the reins and ran with them, finding strengths in all aspects of the business and working together to increase sales and their customer following. They took the values instilled in them by their parents, Paul & Sandy, about superior customer service and how important it is to give back to the community that supports them. In May of 2007, Sandy lost her long battle with breast cancer and although the family was devastated, decided to create a fund in her name. 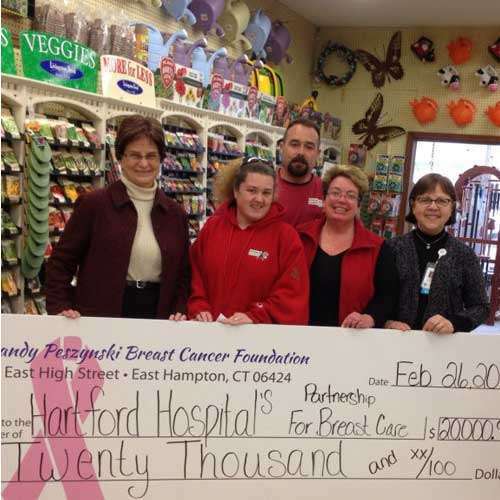 The Sandy Peszynski Breast Cancer Foundation was created and to date has raised over $325,000. This foundation differs from others as 100% of what is donated goes directly to the hospital’s cancer programs to help local women. The walk will begin at the green houses in back of the main store. The walk is recommended for children six years to adults. It will take approx. 1 hour. No dogs please. Heavy rain will cancel the hike and a rain date is on Sunday, Sept. 16th at 3 pm. Visitors should park by the green houses behind the main store or along Old Marlborough Rd. Please do not park on Rt. 66.